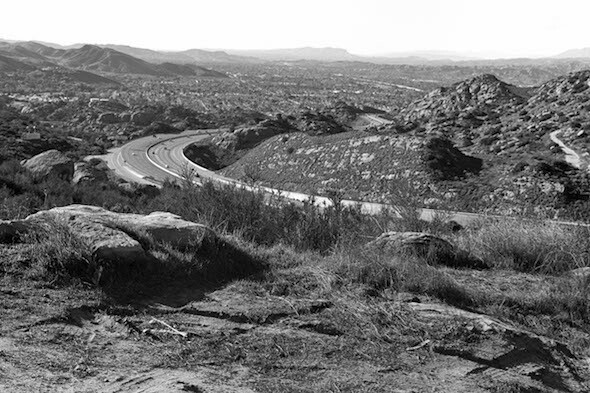 Fault Zone, BQ’s latest exhibition featuring work by American-born photographer Owen Gump, consists of a series of black and white photographs taken in the San Fernando Valley, just outside of Los Angeles. Gump’s photographs depict in stunning detail the diversity of Los Angeles’ surrounding natural environment, where sun-bleached boulders and lush vegetation abound. Shot on the former site of the Spahn Ranch, an area that has seen everything from Hollywood production teams to Charles Manson’s murderous cult, the photographs examine the impact of human development on natural environments. Gump trained as an urban planner in the US before moving to Germany to pursue photography, which perhaps accounts for his attention to human expansion into the natural world. Many of his landscapes feature subtle evidence of urban development impinging on the surrounding wildlife. In one photograph, distant highways and housing developments can be seen snaking through the surrounding hillsides; in another, near-invisible telephone lines bisect adjacent natural formations. These manmade structures appear as organic as the land they inhabit in Gump’s images, seemingly responding to the languid slump of a hillside or the rugged surface of an upturned rock. Owen Gump — “No Title” (2015), Carbon print on baryta paper, 32 x 47 cm; Image courtesy BQ, Berlin. 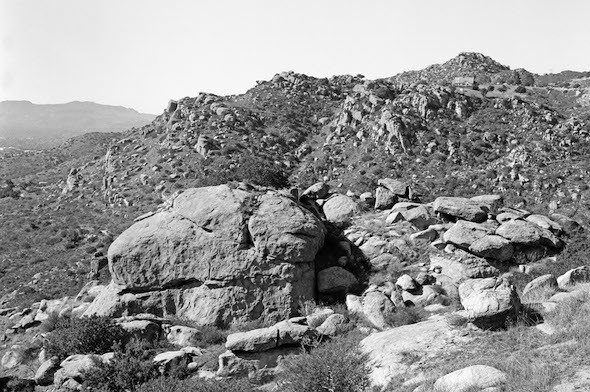 Gump’s choice of location – the former site of Spahn Ranch, which is presently incorporated into the Santa Susana Pass State Historic Park – is intriguing for its cultural associations. The site was repeatedly immortalized through the medium of film, appearing in Hollywood Westerns throughout the 1940’s and 50’s. Stars like Joseph Cotton and Roy Rogers filmed some of their most famous work on the ranch until Hollywood studios ceased producing films within the increasingly unprofitable genre. The Manson Family eventually took up residence at the ranch and lived there throughout their infamous murder spree, causing a media firestorm after the 1969 murder of actress Sharon Tate. In 1970, shortly after the members of the cult were arrested and indicted, a fire destroyed the buildings on the ranch and left the lot mostly empty. Spahn Ranch’s present state is notable considering its peripheral location to the 20th century American cultural zeitgeist. Once representative of the wild, untamed American West and the philosophy of manifest destiny before subsequently becoming the stomping grounds to the most notorious group of modern murderers, the site is now subject to the impending threat of urban sprawl as the questionably sustainable Los Angeles metro area continues to stretch into the surrounding land. In this context, the houses dotting the hillsides in Gump’s photographs are almost foreboding. The landscape of the former Spahn Ranch has already been altered by bygone manmade structures, and the cultural weight of events associated with the land has withered from public consciousness over time. Still, the land stands serenely as the Los Angeles metro encroaches on its neighbouring territory. Gump’s landscape photography subtly document this expansion and contraction of society, functioning as an aesthetic investigation of the impact humankind has on its surrounding environments. Invitation Card, Owen Gump “Fault Zone.” BQ, Berlin 28 February – 18 April 2015; Image courtesy BQ, Berlin. A.H. McGavin is a writer based in Berlin, where she spends most of her free time exploring the city and conducting culinary experiments.